OnePlus looks set to unveil its hotly-anticipated OnePlus 7 very soon, provided the Shenzhen-based start-up sticks to its typical launch schedule. Ahead of the upcoming release date, we've seen a raft of leaked details, pictures, and 3D renders around the flagship phone. Based on everything we've seen and heard, it seems OnePlus has something truly special planned this year. As we patiently wait for the release, we'll keep this article updated with every whisper or leak we hear about the next-generation OnePlus flagship. Stay tuned. OnePlus typically launches two flagship smartphones each year, one in the first six months of the year, followed by an iterative "T" variant in either October or November – ready for the Christmas shopping rush. The OnePlus 6 was announced on May 16, 2018, while its predecessor, OnePlus 5, debuted on-stage on June 20, 2017. As long as OnePlus sticks with the same launch schedule, we'd expect to see OnePlus 7 launch anytime between now and June 2019. In fact, one of the latest whispers around the launch, courtesy of Twitter tipster Ishan Agarwal, suggests the OnePlus 7 will debut on May 14, 2019. Agarwal has a pretty solid track record forecasting previous OnePlus and Google Pixel announcements, so it's entirely possible this will be the date of the launch event. Since OnePlus unveiled its OnePlus 6 in May 16, the alleged May 14 release date for its successor certainly doesn't sound outside the realms of possibility. When it comes to pricing, we'd expect to see a slight bump in price for the next handset from OnePlus. After all, the company has been slowly increasing prices as it adds new features and improved specs. At launch, the OnePlus 6T – the most recent flagship from the firm – started from £499 ($549) and topped-out at £579 ($629) for the priciest configuration. OnePlus looks set to really shake-up the design of its new flagship. 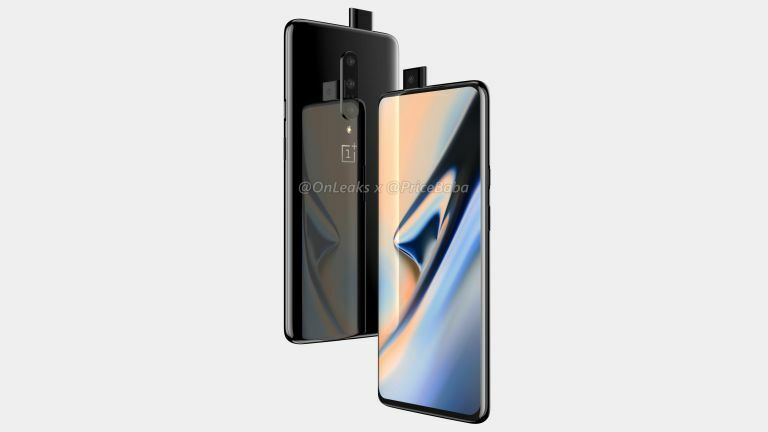 According to a number of leaked images of the handset, OnePlus 7 will have a display that fills every single corner on the front of the device. To accommodate this truly edge-to-edge screen, the front-facing camera will seemingly be relocated into a small tray that pops-up from the top of the handset. This means they'll be no need for the notch display introduced with the OnePlus 6, and then shrunk with the OnePlus 6T. Leaked images purporting to show the final design show an edge-to-edge display with no notch and the razor-thin bezels. As such, it's a little unclear exactly where the front-facing speaker, proximity and ambient light sensors will be housed. It's possible the sensors could be relocated to the border of the phone, or embedded beneath the display, like the Huawei P30 Pro. However, when it comes to the fingerprint sensor, we'd expect the OnePlus 7 to follow in the footsteps of its predecessor and include the fingerprint scanner embedded beneath the display. In our OnePlus 6T review, we found that the in-display sensor is "works like a charm, being easy to setup and use". Speaking of the new screen, OnePlus looks like it might take a leaf from Samsung's playbook and add a curve to the glass display. This dual-curved approach, which allows the manufacturer to squeeze a larger screen into a body that remains narrow enough to comfortably use one-handed, has long been a trademark of the Samsung Galaxy S series, although it was dropped from the Galaxy S10e earlier this year to make it more cost effective. Huawei has also started to use the screen design, most recently with the P30 Pro. According to a recent leak courtesy of smartphone comparison site Tiger Mobiles, OnePlus plans to introduce a slew of interesting new colour options with its next handset. The Shenzhen-based company looks set to take a leaf out of Huawei's playbook and use a similar two-tone gradient effect to the one seen on its most recent round of flagship phones, including the P20 Pro and Mate 20 Pro. If the latest OnePlus 7 leak is accurate, we can expect to see three new colour finishes – Black Yellow, Black Purple, and Cyan Grey. These start with either Black or Cyan at the top of the device by the rear-mounted camera and then slowly fade into the secondary colour. It's an impressive effect, and should help the handset stand-out on the shelves of your local Carphone Warehouse. As you can probably tell from the leaked images above, we're expecting to see a triple-camera on the back of the OnePlus 7. It's not clear exactly what new camera features this will enable, after all, OnePlus 6T already offers artificial bokeh-style blur in portrait images as well as 2x optical zoom. It's possible we'll see an ultra-wide angle lens added to the set-up to follow in the footsteps of the Samsung Galaxy S10, among others. OnePlus has already confirmed that its next flagship smartphone will be powered by the Qualcomm SnapDragon 855. This top-of-the-line chipset will likely be coupled with 10GB of RAM, which OnePlus previously used in its OnePlus 6T McLaren Edition. OnePlus has also confirmed that it will not include support for wireless charging via the Qi standard. Despite the widespread adoption of the technology, OnePlus still doesn't believe the charging system is worth bringing to the next smartphone range because it can't get anywhere close to the same speeds that it achieves with its wired alternative, previously known as Dash Charging. Elsewhere, OnePlus 7 will be the first smartphone from the company to adopt the faster UFS 3.0 storage variety, according to serial tipster Ice Universe. The handset, which Ice Universe simply refers to as "the next OnePlus", can purportedly deliver read speeds of 2279.8MB/s. The OnePlus 6T employs UFS 2.1 storage, which offers sequential read speeds of 800MB/s. That's over 2x faster. It's worth noting that one feature the OnePlus 7 definitely will not have is support for 5G networks. That's because OnePlus has already confirmed plans to launch a brand-new 5G-compatible smartphone before it debuts its new flagship device, seemingly called OnePlus 7 early this summer. OnePlus CEO Pete Lau has forecast that bringing 5G support is likely to add between $200 (£155) and $300 (£235) to the price of a OnePlus device. Given that the maxed-out OnePlus 6T currently costs £579 ($629), the 5G-touting successor looks likely to be within sight of the £1,000 mark. With a price tag sitting around £814, OnePlus will be asking fans to cough-up a considerably more than its previous efforts. The OnePlus 7 launch event also looks set to bring a pair of next-generation "extreme" wireless earbuds, similar to the Apple AirPods. Of course, there's plenty of time for more details and leaked photos to emerge from the supply chain. As always, it's worth taking this with a healthy pinch of salt as nothing is official until it's announced on-stage by CEO Pete Lau. OnePlus 6T vs iPhone XS Max: which is best for you?